Mushroom (Fr. mousseron, hommousse, moss, because mushrooms are often found growing in it), the name of several edible fungi, chiefly of the genus agaricus. The genus is large, and contains the most highly organized forms found among fungi; the number of species known to be edible is few; untested agarics, and those known to be poisonous, together with other fungi of similar appearance, are popularly called toadstools. The agarics have an abundant mycelium, known to gardeners as the srrawn, consisting of white, cottony filaments, which spread in every direction through the soil; this, which is the vegetative portion of the plant, grows quite out of sight. That which is popularly recognized as the mushroom corresponds to the inflorescence in other plants; this appears upon the mycelium as a small knob, and soon pushes its way to the surface, where it is at first nearly spherical, but it rapidly develops and shows its various parts. 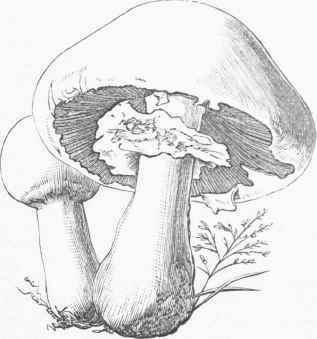 There is a stem, bearing at its top an expanded, umbrella-shaped portion, the irileus or cap. In the button state, the covering or skin of the cap (voha) is attached to the stem, but as the cap expands this breaks away, leaving a fragment upon the stem, known as the ring or annulus. Upon the under side of the cap are numerous thin vertical plates, radiating from the stem, but not attached to it; these are the liymenium, popularly called the gills; a thin transverse section of one of these plates, when highly magnified, shows its surface to be studded with large cells terminating in four points, each of which bears a spore. The different species of agaricus present great variety in the form and size of the cap, and the color and character of its surface; the gills and the spores vary in color, which serves to divide the genus into groups according as they are white, pink, rust color, purplish brown, or black. Mushrooms grow wild in Europe and America, and a majority of the edible species are common to both. In the articles Fungi and Lycoperdon reference is made to the recent attempts of English naturalists to increase the list of edible fungi, and to popularize them as articles of food. In this place are enumerated the principal species which have received the name of mushroom, and are common to both England and the United States. - Locality appears to have much to do with the quality of mushrooms. Some of the agarics which are highly esteemed in England have here proved unpalatable, and the common mushroom, A. camyestris, so generally eaten elsewhere, is not only rejected in the markets of Italy, but is regarded with dread. 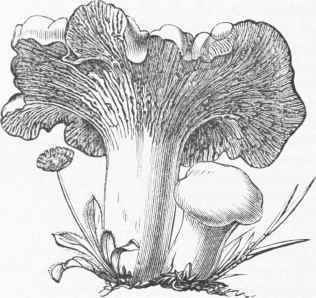 This varies considerably, but in all cases is to be distinguished by its white, firm, solid stem, its fleshy cap, and its pink gills; when the cap begins to expand the gills are pale, but they soon become pink, and on this account it is in some parts of this country known as the pink-gill; when older the gills become chocolate - colored and then tawny black, in which state they are regarded as unfit for food. It has a pleasant and characteristic odor, by which those familiar with it can distinguish the plant. This species is found in pastures, and in some years in great abundance; its proper season is September and October, when our markets are abundantly supplied from the wild growth; at other times cultivated mushrooms are to be had, but at very high prices. This is the only species cultivated. Mushrooms resemble flesh in flavor more nearly than do any other vegetables, and it is asserted by Badham that they contain similar proximate principles. They are used to form a dish by themselves, either stewed, broiled, or baked, and are largely employed to flavor other dishes, entering into a great variety of stews, fricassees, and sauces; many are consumed in the preparation of catsup, which is the juice of the mushrooms extracted by sprinkling them with salt and flavored with spices. The general testimony is that mushrooms are highly nutritious, but difficult of digestion, and unsuited to persons with delicate stomachs. - The horse mushroom (A. arvensis), called snowball in the southern states, has a hollow stem, with a broad, pendulous ring; a slightly conical cap; the gills brownish white, and never of the pure pink color of the preceding; while the common mushroom rarely excels 3 or 4 in. across, this is sometimes more than a foot; it turns brownish yellow when broken. This species is quite common, and in English markets is much more abundant than the other. 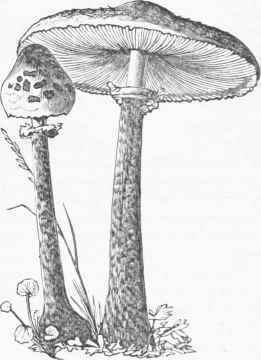 The parasol agaric (A. procerus) has a stem 6 or 8 in. high, hollow, with a loose pith, and tapering upward from a pearlike bulb at the base; ring loose on the stem; the cap when expanded is 3 to 7 in. across, with a blunt point in the centre, and with a brown and more or less torn cuticle; gills white. According to the late Mr. Curtis, this when fresh has the flavor of a hazel nut, and he calls it the nut mushroom; he considers that this flavor, together with the movable ring upon the stem and the brown color, will allow of its ready identification. In England this ranks as one of the finest flavored, and those who have tried it here coincide in the opinion. A. prunuhts, A. ruhescens, and A. nebularius are species common to both England and the United States. The favorite mushroom of Italy, A. Gcesareus, regarded as the most delicious of all fungi, was found abundantly in North Carolina by Mr. Curtis, who called it the imperial mushroom. - The French call all mushrooms champignons, but in England the name is restricted to the fairy-ring champignon, which is by some called agaricus oreades, and by other authors it is placed in the genus nuwasmius. The fairy rings which are so common in pastures and lawns in England are circles of bright green in the grass of a few feet to several yards in diameter; these are produced by the mycelium of fungi which, having exhausted the soil within the ring, is constantly spreading and enlarging the circle. The champignon is the most important of these fungi; it is only 1 or 2 in. 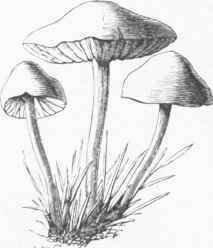 in diameter, with a very tough stem; the cap is dull fawn color when moist, and when dry creamy white, with the gills of the same color, broad and far apart. A very acrid champignon, A. urens, has a similar appearance, but the gills are narrow and much crowded. The champignon is one of the most highly flavored fungi, and may be kept in the <\ry state for years without losing its aroma. - The chantarelle (cantharellus cibarius), one of the esteemed rarities in England, was found in great abundance in North Carolina, but was not relished by Mr. Curtis or his friends. Mr Curtis in a letter to the Rev. Mr. Berkeley stated that he had eaten 40 species of edible fungi collected within two miles of his residence, and that ho had dct.-ctcd ill kinds in North Carolina alone. 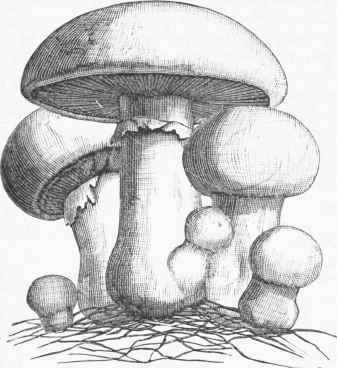 - The cultivation of mushrooms, which is so largely practised abroad, is in this country mainly confined to private gardens; an attempt was made by the lute Prof. Blot to cultivate them on a commercial scale, but his structures, being of wood and underground, decayed and fell to ruin before the success of the project was established. Occasionally a florist may make a bed for mushrooms under the stage of his greenhouse, and from these and other sources there is a scanty supply of fresh mushrooms; but except during the autumn months restaurants and hotels depend upon those imported from France in sealed tins. The mushroom appears to be dependent upon the horse, it being supposed that the spores are taken into the animal with the grass it eats, and germinate in the droppings; the manure of horses and cattle is the medium in which the mycelium of the mushroom flourishes most vigorously; hence in cultivation an abundant supply of this is required, and also a stock of mycelium or spawn. The earth of riding schools, or that from the track of a horse mill, in which the droppings of the horses are thoroughly beaten into the soil, is found to afford an abundant supply of spawn; when once obtained it can be multiplied to any extent, and, as it retains its vitality when dry, can be transported; that sold in this country comes from Europe. Horse and cow droppings and loam are mixed together and formed into blocks like large bricks; when these are partly dry, a hole is made in each and a small piece of spawn inserted; the bricks are then placed upon a hotbed and kept at a temperature of 60° F. until the whole mass of each is permeated by the threads of the mycelium; further development is then checked by completely drying the bricks, and afterward they are stacked away in a dry place for use or for sale. Mushrooms are grown in houses built for the purpose, in out buildings, cellars, caves, or wherever a uniform temperature of between 50° and 60° can be maintained. Cultivators vary so much as to details that general principles only can be stated. Some use pure horse droppings, others mix these with those of cattle; the beds are made of the fermenting manure built up solidly and large enough to maintain a heat of about 70°. 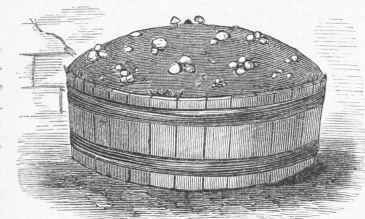 The bed being of the proper temperature, bits of a brick of spawn are inserted in it at intervals, and when the mycelium is growing rapidly, or the spawn "runs," about two inches of soil are placed upon the bed, and it is then covered with straw; water is applied if necessary, and it should be warmed to the temperature of the bed. Mushrooms appear in six or eight weeks, and are collected when in the button state or larger as required; it injures the bed to cut the mushrooms, hence they are twisted off. Instances are given of successful cultivation in tubs made by sawing a cask in two, in boxes which are stacked upon each other, upon shelves in a stable, and in other unusual places. In England beds are profitably made in the open air, but with us the extremes of temperature are too great for this kind of culture. 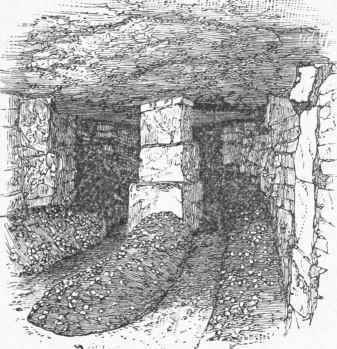 Mushroom culture is conducted upon the largest scale in the vicinity of Paris, where there are extensive caves formed by the removal of building stone; these caves are from 20 to 60 ft. deep and of great extent; one of them contains 16 m. of mushroom beds, and in another the beds measured one year over 21 m. in length. As the plant does not require light, and as these caves have the requisite uniformity of temperature, they are utilized by the mushroom cultivators, who, notwithstanding the labor and difficulty of bringing the immense quantity of manure to the spot, find it a profitable business. One of the large quarry plantations when in full bearing sent 8,000 lbs. of mushrooms to the Paris market daily. - Notwithstanding the efforts that have been made abroad to add various neglected fungi to the food supply, the fact that there are many which are highly poisonous has confined the use of all but the commoner species to a very few enthusiastic amateurs. Unfortunately there is no general rule for distinguishing the wholesome from the harmful; the colors produced by contact with a silver spoon or by the action of salt have been proposed, but are fallacious, and the only guide to be relied upon is an eye educated to observe the peculiarities of structure, color, etc, which characterize the various species. As a general rule, the wholesome fungi have an agreeable smell and taste, and all those with a repulsive odor and an acrid taste in the fresh state should be rejected. 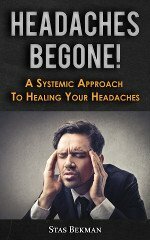 - Most of the general treatises upon gardening have a chapter on mushrooms. Descriptions of species will be found in Badham's "Esculent Funguses of England" (London), Cooke's "Handbook of British Fungi" (2 vols., London, 1871), and the numbers of the " Gardeners' Chronicle " (weekly, London) for several years past. For cultivation, see Robinson's "Mushroom Culture" (London, 1870). Fairy Ring Champignon (Marasmius oreados). Mushrooms grown in a Cask.